I was a bit envious of the jump that the A. Lincoln blog got on me in posting something about the historical significance of Barack Obama’s visit to Harrisonburg, Virginia. 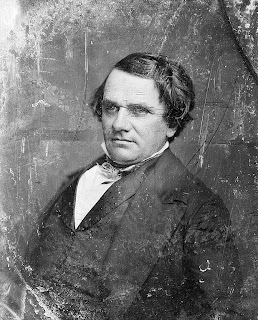 If you aren’t aware, the last time a presidential candidate came to Harrisonburg was in 1860, with a visit by Stephen Douglas! The circumstances, of course, were very, very different. Douglas wasn’t supposed to be actively campaigning in his own behalf at all–no presidential candidates did so, back then. And Douglas showed a fair amount of personal courage in speaking openly before a Virginia audience; he was pretty much persona non grata to white Southerners at this point. Well, this is interesting and, though it isn’t necessarily Civil War memory, this is an issue of memory significant to sentiments in the Shenandoah Valley leading up to the Civil War. In fact, Douglas was received quite warmly when he came to Staunton on Saturday, Sept. 1, 1860, and then at Harrisonburg on a rainy Monday, Sept. 3, 1860. It’s important to remember that the upper South, and especially the Shenandoah Valley, was not necessarily in harmony with the lower South, even at this late point in 1860. Nevertheless, note these links to the transcribed pages from a very supportive Republican Vindicator (Staunton, Va.) available courtesy of the Valley of the Shadow site… Aug. 31, 1860, Sept. 7, 1860. Though the Staunton Spectator did not agree with Douglas, it too seemed to praise the man quite a bit in the Sept. 4, 1860 issue. Incidentally, there is a hyperlink within the Sept. 7, 1860 transcription of the Republican Vindicator that will take you to a pdf of page 2 of that particular issue. Douglas’ Harrisonburg speech is in column 4 of page 2. In the four-cornered fight for the Presidency in 1860 the Rockingham Register supported Douglas. In the issue of August 3, 1860, the editor disapproves the talk of revolution and declares for the preservation of the Union, yet expresses fear of ‘black republican fanatacism’ and flays the abolitionists. Considering the Presidental election returns for 1860, out of all of the counties in the Valley, though he drew votes from all of the counties, Douglas (Democrat) was only successful in Rockingham County. John C. Breckinridge (Southern Democrat) swept most of the counties, while Constitutional Union candidate John Bell took only three (including Augusta County, in which Staunton is the county seat). Antebellum politics in the Shenandoah Valley is an interesting topic. I’ve written a little about it before and hope to write more about it in the future.